A glaucous-green screw in the sky! 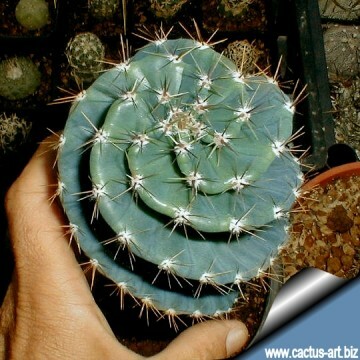 Description: The spiral cereus (Cereus forbesii cv. 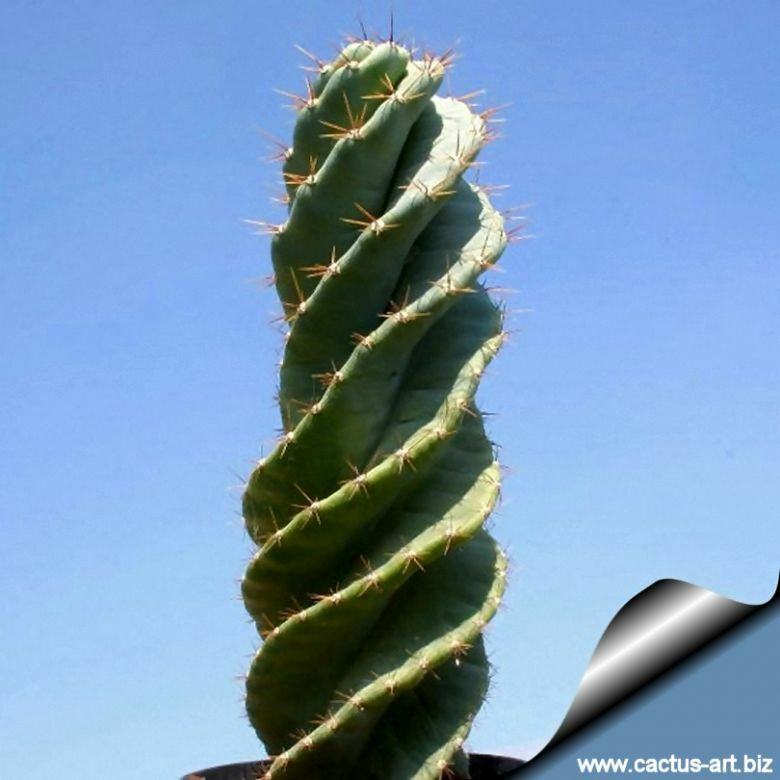 Spiralis ), is a shrubby or treelike species dubiously thought of as a mutant Cereus forbesii. 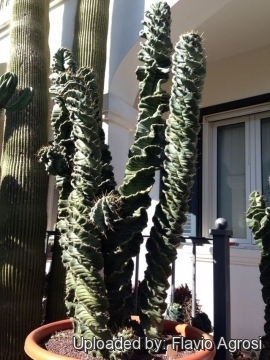 It is a (usually) trunkless cactus that forms numerous tall, ascending, columnar stems which branch at the base in a candelabra-like arrangement. 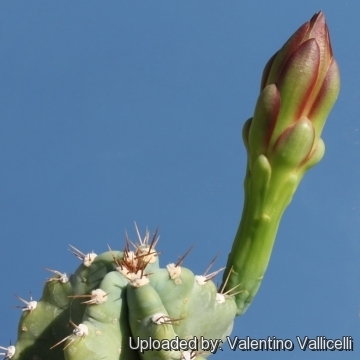 Stems have a waxy bloom on the surface and reach a height of 2-4 metres (but can grow up to 5 m high or more), and are 10 to 12 cm in diameter. 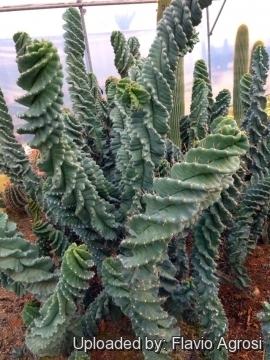 They have five to nine widely-spaced ribs. 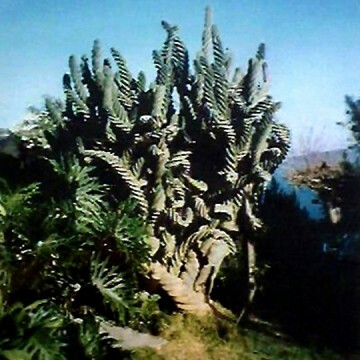 A few branches from the original plant were imported in Europe around 1980 for a very hight price. 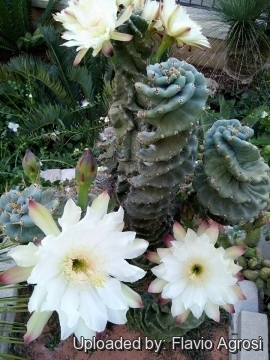 The original clone was characterized by strong grey stems covered with a dense pruina coating and with short spines (Also known as "short spined clone"), but nowadays almost all the plant on the trade are seed grown specimens derived from cross pollination with (presumably) Cereus peruvianus or Cereus stenogonus, they are usually a darker blue-green colour usually with longer spines, and there remains a considerable confusion surrounding the true identity of this plants. 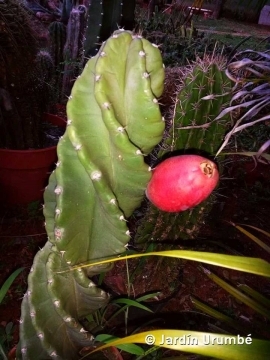 It is a heavy bloomer and large purple fruits are easily produced when flowers are pollinated. It is self-sterile. 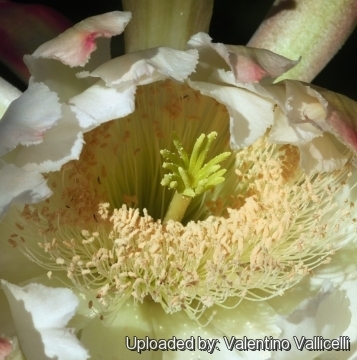 There are a total of 23 Photos.